The easiest salmon cakes you’ll ever make! 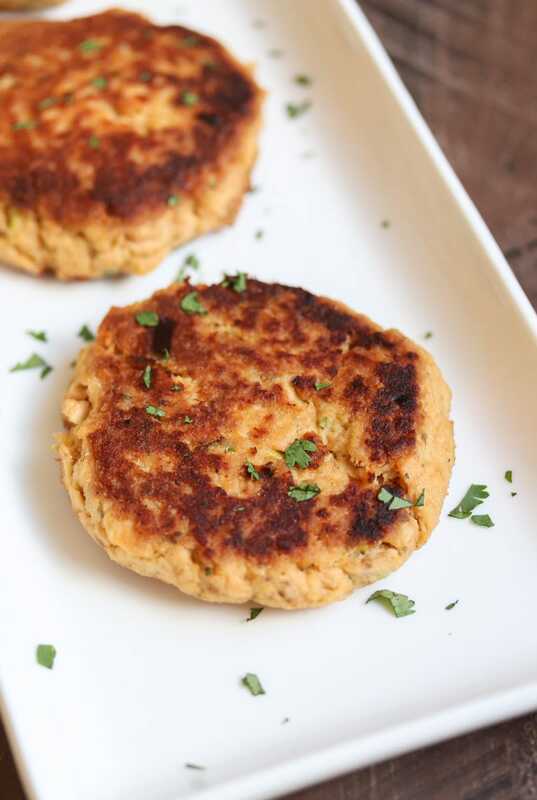 These paleo salmon cakes are made with canned salmon, paleo mayo, spices, and almond flour! Serve them as an appetizer or with your favorite veggie for a complete healthy meal. I love making easy meals, especially during the week. I’m also a huge lover of seafood, especially salmon and crab! I’ve made crab cakes and tuna cakes many times but never salmon cakes until recently. 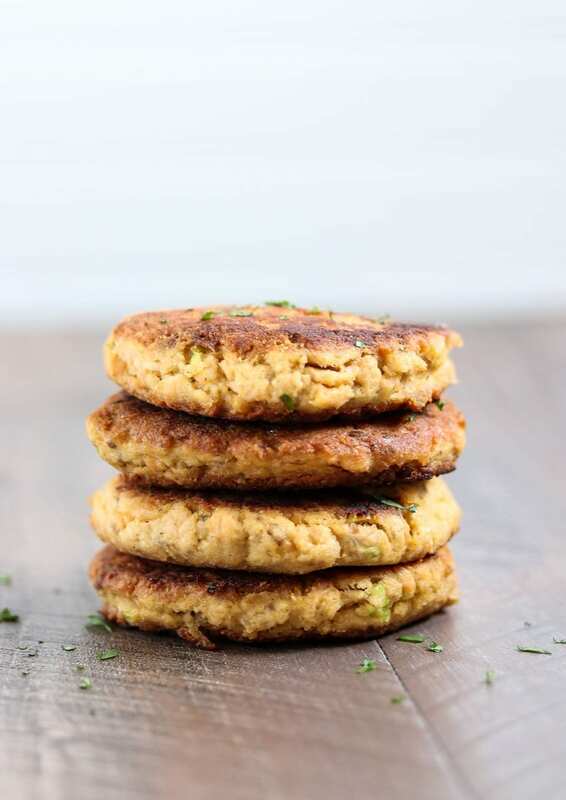 Making salmon cakes at home is great because you control the ingredients that go into them which usually results in a healthier salmon cake, like these paleo salmon cakes. No wheat, no grains, no soy or canola. Just squeeky clean ingredients and salmon. 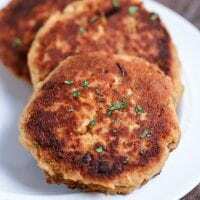 This recipe makes two servings of paleo salmon cakes (2 cakes for each person) but you can double the recipe to serve 4. You could also make 8 small salmon cakes and serve them as an appetizer at your next party. Topped with Kite Hill Chive Cream Cheese (dairy free, made with almonds) and served with a side of roasted broccoli. The easiest salmon cakes you'll ever make! 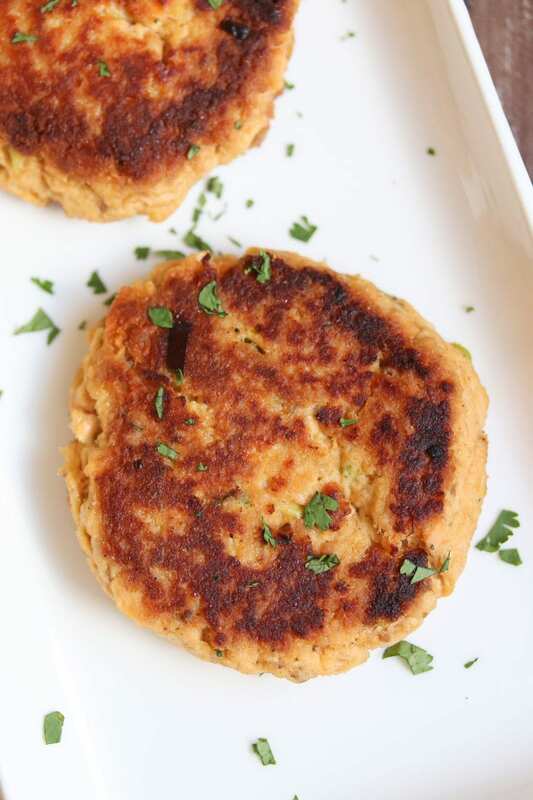 These paleo salmon cakes are made with canned salmon, paleo mayo, spices, and almond flour! Serve them as an appetizer or with your favorite veggie for a complete healthy meal. Place the drained canned salmon in a large mixing bowl and break up with a fork. Add the almond flour. Form the salmon mixture into four equal sized patties. Place on a plate and put in your freezer for 10-15 minutes. Alternatively you may place in your refrigerator for 1 hour. Place the salmon cakes into the hot skillet and cook for 3-4 minutes per side, or until golden. Serve with tarter sauce or your favorite dipping sauce. *you may use a 10 inch cast iron skillet (or any type skillet but cast iron works best). If using 10 inch, cook the salmon cakes two at a time. So, there’s actually a good quality canned salmon out there? I never knew. So I just usually make these with leftover cooked salmon. I’ll have to start looking… Thanks! Yes, there is! Vital Choice products are sustainably caught, wild, good quality. They are pricy but I’ve found that is the case with any good quality meat. Those look perfectly delicious! Thanks for sharing at the What’s for Dinner party. Hope to see you at this week’s coming up too! Have a wonderful weekend. Your salmon cakes look so flavorful, looking forward to trying your recipe. Thank you for sharing on Fiesta Friday! These sound really good. However, wondering if you put the almond flour on the outside as a breading before frying them…because I couldn’t find that in your recipe. They sound delicious and healthy! Thanks for sharing with SYC. I usually buy “Wild Planet” brand but will check on the difference with Vital Choice. I always keep a few cakes in the freezer for a quick meal. Your recipe is certainly healthier! 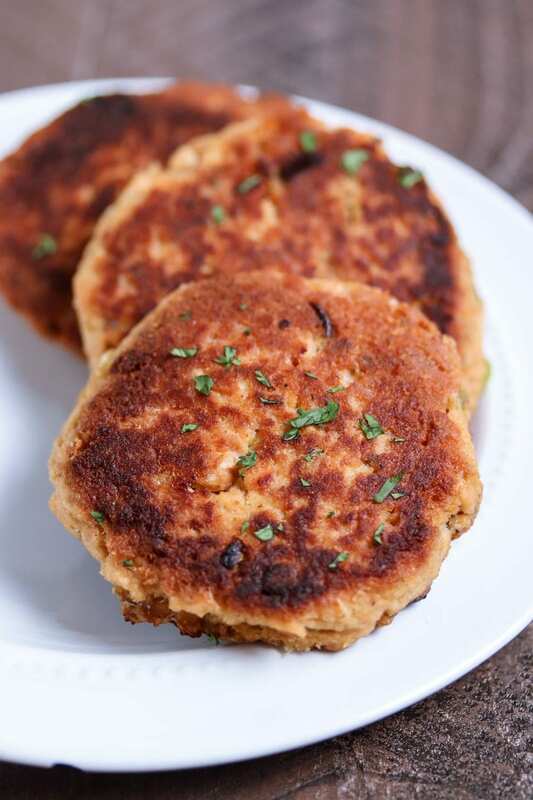 Your Salmon Cakes look amazing, we will love them! Thanks so much for sharing with us at Full Plate Thursday and have a great week! Thanks for sharing with us at the To Grandma’s house we go link party, hope to see you next week!